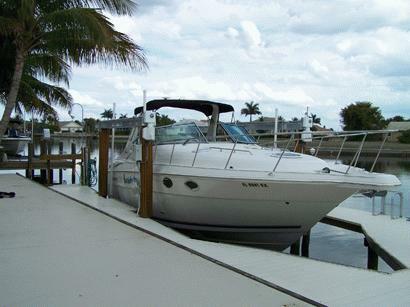 If you have been searching for a well maintained, properly powered 2004, MONTEREY 322CR, you've just found it! Aside from being lift stored and extra clean, this boat features; the preferred MerCruiser HORIZON 350 M package, Duo Stainless Steel Props, Retractable Radar Arch (reduces height by 22"), Custom Velcro Canvas (which means no snaps to hassle with) and even a custom made filler that creates an additional berth in the salon. The ONAN 5.0kw Generator has only 203 hours and helps deliver all the comforts of home including A/C and/or heating while at sea. Have you ever had your shorts get caught on a cleat while getting on or off of a boat? Thanks to the recessed retractable cleats, that won't happen to you on this one. Last Serviced 10/24/09. New Spark Plugs, Oil and Filters, Fuel Filters, Water Pump Impellers, new selanodes on the engines, replaced the heat exchanger and battery for the gen set and fully waxed. Enjoy the vessel walk-through photos below, but to really appreciate this boat come view her in person! You won't find another MONTEREY 322CR with all the extra features like this. She has always been properly maintained, and it shows! Being that this vessel was just fully serviced, it's "get in and go". Don't miss out by calling 239-430-BOAT(2628)today. MASTER BERTH:Queen Berth, Located forward. Ample storage and lighting throughout. Twin bunks are located aft for guests. SALON: Features an L-Shaped Dinette/Sofa and custom filler to create an additional berth! GALLEY: Spacious counter top; Refrigerator; Dual Stove Top; Hot/Cold Pressurized Water; Microwave; Coffee Maker along with upper and lower storage cabinets. DECK: Swim Platform w/ladder; fresh water washdown; Trim Tabs, Refrigerator on Deck and ample storage throughout. ELECTRONICS & NAVIGATION: SIRUS XM Radio; Garmin GPS 182C; Quest VHF Radio GX1; Faria Depth Finder; Bennett Trim Gauges. ELECTRICAL SYSTEM: 120 Power Outlets, 30 Amp Power/50' Cord, Battery Charger, Carbon Detector, Halon System, Trim Tabs, Automatic Bilge Pumps, Air Conditioning with Reverse Cycle Heat. ADDITIONAL BROKER'S REMARKS: Showings by appointment only. EXCLUSION COMMENTS: Owners personal items. LOCATION: Marco Island, Florida. Call: Jerry Chiappetta, Jr. at 239-430-BOAT(2628).